Business confidence has improved marginally with stray signs of a pickup in the economy, finds the latest Business Today-C fore Business Confidence Survey. Many Indian exporters were delighted when the rupee fell like a stone last year. But not Ludhiana-based S.C. Ralhan, whose company, Sri Tools Industries, makes hand tools for the US and European markets. He says his customers pushed him to factor in the depreciation and offer a 10 per cent discount when the rupee fell below 68 to a dollar last August. He is still saddled with the discounted rate today, though the rupee has bounced back from its historic lows. "It is a buyer's market and we have limited control on pricing of products. The situation is affecting our profit margins," he says. Apart from prices, Ralhan is also worried about a rising backlog. His company is sitting on an order book of three months because of a labour shortage that has delayed shipments. "We are almost two months behind the shipment schedule. Even though the order-book has gone up by almost 10 per cent, slow execution has impaired my negotiation ability," he says. But things have started looking up a bit for the overall Indian economy, according to the latest Business Today-C fore Business Confidence Survey. The survey for the October-to-December 2013 quarter found sentiment among corporate leaders had improved marginally compared to the previous quarter. On a scale of 100, confidence level was at 48.6 in the third quarter of 2013/14, up from 48.2 in the previous three months. Market research agency C fore quizzed 500 CEOs and chief financial officers across 12 cities for the survey. Apart from the overall index, some parameters also saw moderate improvement . For instance, 33 per cent of the respondents expected the overall economic situation to worsen during the October-to-December period when they were surveyed at the end of September. Now, fewer respondents - 12 per cent - expect the overall economic situation to worsen in the January-to-March period. Similarly, 24 per cent of the respondents saw their demand conditions worsening during the July-to-September 2013 period (compared with April-to-June 2013). The corresponding figure for the October-to-December 2013 period is lower at 15 per cent, hinting at an uptick in demand conditions. 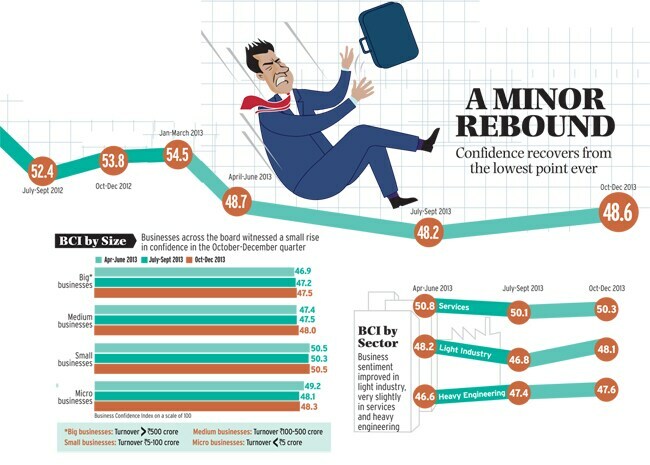 Business confidence hit a high of 74.8 in the quarter ended March 2011, when the survey started, before dropping to its lowest point in July-September 2013. Sentiment in the first half of this financial year was largely subdued due to many factors, including the sharp rupee depreciation, the soaring current account deficit, weak economic growth and stubbornly high consumer inflation. The situation improved on some of these fronts in the October-to-December quarter. For instance, the current account gap narrowed to $5.2 billion, or 1.2 per cent of gross domestic product (GDP), in the second quarter of 2013/14. GDP growth too inched up to 4.8 per cent during the same period, 40 basis points higher than the first quarter of 2013/14. "In the first two quarters of 2013/14, there was a lot of uncertainty among businesses, investors and general consumers. The reason for the improvement could be the current account deficit has gone down and even external factors have improved," says Mahesh Nandurkar, Executive Director at Hong Kong-based CLSA. The survey shows 27 per cent expect exports to pick up in the January-to-March quarter. Ajay Sahai, Director General and CEO of the Federation of Indian Export Organisations (FIEO), says most major markets are showing some improvement. "In the US, unemployment rates are falling and consumer spending is picking up," he says, adding that exports are expected to grow 13 per cent in 2013/14. The repo rate set by the Reserve Bank of India (RBI) - which was left unchanged at its last monetary policy review- will certainly impact business in the January-to-March quarter, say 69 per cent of respondents. A substantial 75 per cent do not expect any change in the overall economic situation in this quarter. Siddhartha Sanyal, Chief India Economist, Barclays, says: "Things have stabilised but have not begun improving as yet. Expectations are building up that the economy will start to recover but it is still not clear when and at what pace recovery will take place." 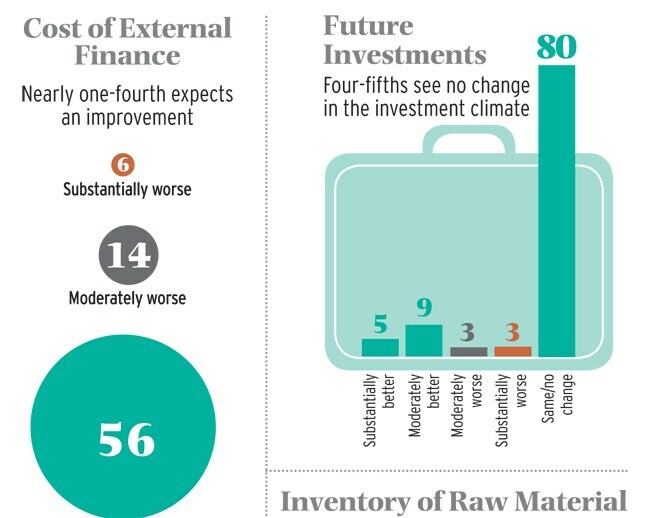 Raw material costs remain a concern for companies, with 89 per cent of respondents expecting costs to either go up or stay the same in the January-to-March quarter. "I do see a reason for price increase. High inflation will have a cascading effect on input costs. The spike in the exchange rates will also play up as the electronics industry is dependent on imported raw material," says Bhaskar Pramanik, Chairman Microsoft Corporation India. Eighty per cent expecting no change in investment plans in the January-to-March quarter. N.H. Bhansali, CFO and President, Emami, says fresh investment is a function of anticipated rise in demand and generating demand is the biggest challenge. "In the FMCG sector, there's only price growth happening. Volume growth is not there even in the categories which are considered necessary - soaps and detergents." According to the survey, 34 per cent expect profit growth to deteriorate in the January-to-March period. Nandurkar says corporate results will not be great in the December quarter anyway. "The traditional IT business is under pressure. 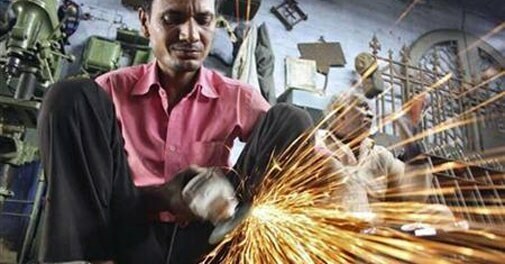 When demand is suppressed and costs are high, margins are bound to be under pressure," adds Pramanik. Still, a high 91 per cent expect production levels to rise or remain the same in the January-to-March quarter. One factor, as Ajay Shriram, Chairman and Senior Managing Director of DCM Shriram Consolidated Ltd (DSCL), notes could be the rural sector pulling up the economy. "The agricultural sector has done well both in terms of production and income of farmers. Companies like ours, which are linked to the agriculture sector, will see stable or higher production levels," he says. Surprisingly, nearly 40 per cent expect stock prices to pick up in the January-to-March quarter. Sanyal says stock prices will not wait for the economy to turn around. "The stock market runs on the basis of expectations. At this point, we are a lot more positive on inflation and no further rate hikes," he adds. CLSA's Nandurkar says the recent state election results could be one reason for the optimism. "The BJP won in three state elections recently. Among business CEOs, there's a preference for the BJP." he says. Market research agency C fore conducted the survey. The field work was conducted in December 2013. Five hundred CEOs or CFOs from different industries were interviewed. The survey was carried out in 12 cities - Delhi, Mumbai, Chennai, Hyderabad, Bangalore, Kolkata, Chandigarh, Lucknow, Nagpur, Kochi, Visakhapatnam and Bhubaneswar. The companies were segmented based on their turnover and the products they offered. Those with a turnover of over Rs 500 crore were termed big, those between Rs 100 to Rs 500 crore medium, those with a turnover less than Rs 100 crore small, and those less than Rs 5 crore micro businesses.